First, thanks for this. I have a few of these chips around. First one I bought years ago at RS.Grabbed the others on a discount/clearance table at RS also. One I have from a Coleco Speech Unit. I originally was going to interface one to my SX-64 (which I still have and works). I really would like some help on an RS-232 interface for one of these. Cool you still have an SX 64. I vaguely remember them, must be kind of rare? I can help with an interface to the 64 if it uses a similar connector to the C64; I can dig up some pics / instructions for that. Re: RS232 -- happy to help if I can. Since the SP0256 takes parallel data, the trick is to convert parallel to serial, and also to set up a proper RS232 receiver. 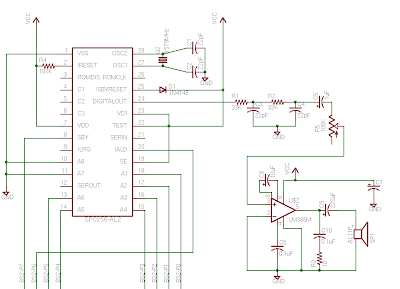 MAX232 is an RS232 driver / receiver chips out there that do proper voltage levels -- datasheet: http://www.atmicroprog.com/download/ci/max232.pdf So that should take care of the reciever side.